A Geological Map of the Black Hills. 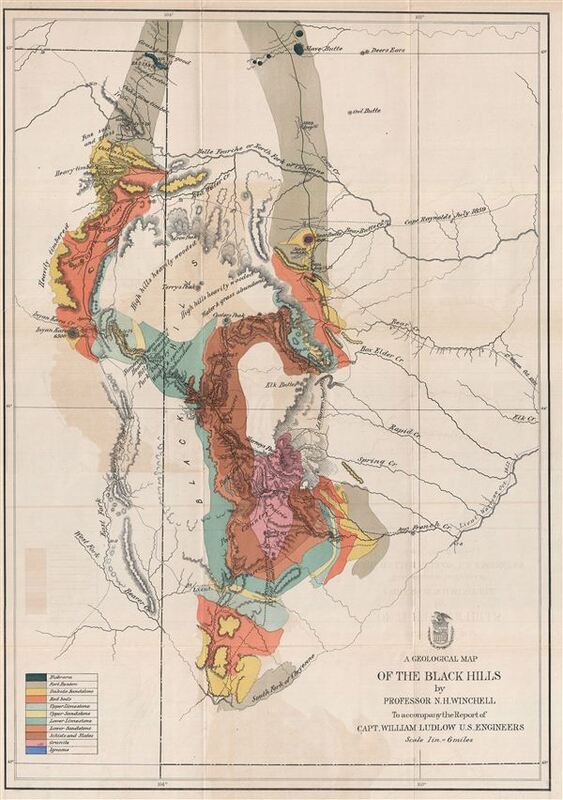 This is a rare example of the 1875 geological map of the Black Hills, South Dakota prepared for the official report on the Custer expedition of 1874. Centered on Harney's Peak, the highest point in the Black Hills, the map covers from Slave Butte to the South Fork of Cheyenne River. Various mountain peaks, wooded areas, creeks, prairies, and other topographical details are also noted. encompassing the Black Hill National Forest, the Black Hills are famous for being home to the Mount Rushmore National Memorial, Custer State Park, Crazy Horse Memorial and other attractions. The routes of Lt. Warren, 1857, Capt. Reynolds, 1859, and the route taken for reconnaissance by Capt. Ludlow, 1857, are marked. Captain William Ludlow, accompanied by Prof. N. H. Winchell (State Geologist of Minnesota) and Mr. George Bird Grinnell, penetrated the region in 1874, attached to the Seventh Cavalry under command of Lieutenant Colonel George Armstrong Custer as part of the United States Army expedition to explore the uncharted Black Hills and South Dakota in order to identify a suitable site for a fort, explore the possibility of gold mining in the region, and find a route to the southwest. Together they produced the rare Report of Reconnaissance of the Black Hills of Dakota, made in the summer of 1874, which essentially opened up the Dakota Territory. The land was originally promised to the Sioux Indians, who considered it sacred, but after the discovery of gold during this expedition, thousands of miners flooded into the region setting the stage for the Great Sioux War of 1876. Two years after this map was made, the Sioux Indians would kill Colonel Custer in the ill-fated battle of the Little Big Horn. Very good. Original fold lines visible. Minor wear along folds. Verso reinforcement near left margin. Offsetting. Blank on verso. Professionally flattened and backed with archival tissue. Wheat, Carl Irving, Mapping of the Transmississippi West, 1540-1861, 1251.